This CEU program consists of 1 streaming videos. Presented by Isabelle M. Bohman, M.S., P.T. 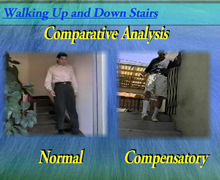 Part 1analyzes a number everyday functions such as picking up a cup and sitting in a chair, opening a door, walking up and down stairs, walking up and down an incline and curb and picking up an object.. Analysis is done in slow motion comparing normal function and the function of three patients. Specific compensatory components of function are identified and analyzed in terms of understanding treatment objectives. Presented by Isabelle M. Bohman, M.S., P.T. Part 2 demonstrates treatment strategies based on the analysis of function for each patient in Part 1. Specific handling techniques are demonstrated and explained as they relate to improving compensatory components identified. Treatment results are demonstrated. 1. Describe the importance of function task analysis. 2. Identify the normal components of movement for each task presented. 3. Identify the compensatory components for each task performed by each client. 4. Identify the treatment strategies appropriate for each client.